Photography, notes, commentary and much more from Reporter Online Editor Chris Stanley. I don't follow the FOX show Fringe, but from what I gather it involves a group of Boston investigators that seek out the supernatural. 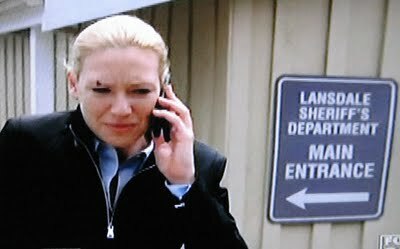 But now I know, thanks to a tip, Thursday night's episode took place in Lansdale. Yes, Lansdale, Pennsylvania. 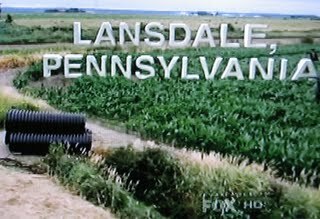 Of course, this is Hollywood, and in their eyes, apparently Lansdale looks a whole like the middle of Nebraska, corn and all. In this version of Lansdale, the police department was replaced by a sheriff. Unfortunately his car was swallowed up by the many holes the baby-mole-zombie thing had dug in the yard of his Lansdale home. You might notice that the colors of the car are correct for the real Lansdale. 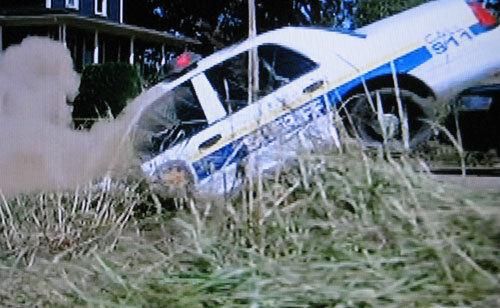 Sources tell me this is because the producers of the show requested a photo of a real Lansdale police car, just so they could get the details right. Now if I could only find the corn fields, the sweeping midwest vistas, and say 'howdy' to the local sheriff in our suburban, un-corned version of Lansdale. The zombie thing I just might believe. This is really really cool :-) Lansdale WAS a GREAT town at one time, and sometimes feels like we now walk amongst zombies.... So the writers are showing what we could be if we don't "move forward" with our thinking and our "ways" as a town.. And so how did we pull this off and get to be noticed nationally on a FOX TV show without the express permission of Wilson's Hardware? We were lol'ing at that. 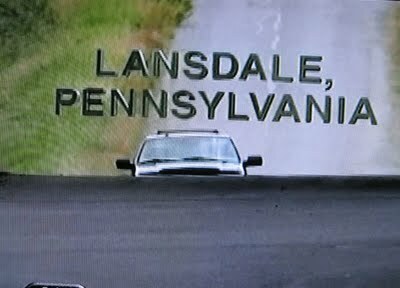 I asked my kids "Is there another Lansdale somewhere in PA? In the middle rural part maybe?" C'mon, Lansdale actually is pretty rural. I live here and it still makes me think of cornfields and pig factories. And Souderton and Hatfield are only a few minutes away, and I can tell you I've literally driven through cornfields there. Lansdale, for all its good qualities, isn't exactly a hoppin' metropolis. It's either cornfields or vacant buildings, with a few nice places mixed in. It's cool that Lansdale was used. How did that come about? No way, what a hoot! I keep saying that our library would be a perfect setting for a comedy, like Cheers. Maybe they're getting close. PS Don't miss Lansdale's first Oktoberfest on Saturday at White's Road. I'll be serving beer from 3-4!